Rahul Gandhialso levied strong charges against BJP president Amit Shah while claiming that BJP and RSS are attempting to divide the nation. 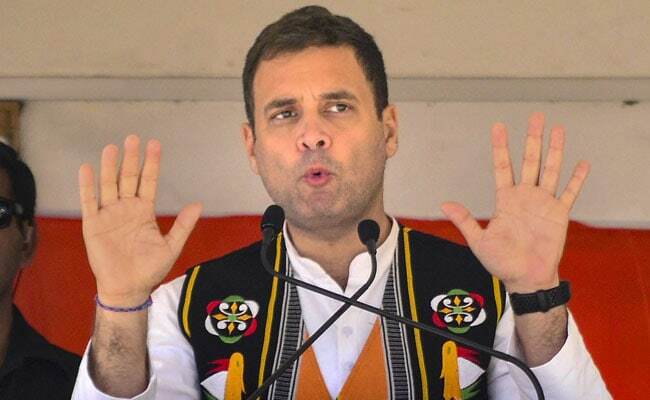 Launching a scathing attack at the BJP, Congress president Rahul Gandhi on Wednesday asked people to choose between the "lie" of BJP's promise of Rs 15 lakh in their bank accounts and "truth" of Congress party's assurance of providing Rs 3.6 lakh to 20 per cent poorest families in five years. "On the one side, there is Chowkidar's lie of fifteen lakh rupees in all bank accounts. On the other hand, there is the truth of Congress to put 3.6 lakh rupees in five years in the bank accounts of 20 per cent poorest people of India. We guarantee to pay them this amount," Mr Gandhi said addressing a public rally here. "Four years back Narendra Modi came and made different promises in all public meetings. Do you remember he promised 15 lakh rupees? Is there anyone in whose account Chowkidar has put any money?" he asked the crowd. He also said that the NYAY scheme was formulated after Congress think tanks researched and held consultations for six months. "I once heard the promise of putting 15 lakh in every account. This Chowkidar lies all the time throughout the day. So, I thought I should put out some truth in front of the people. I asked the think tank people to find out how much the Congress government if it comes to power, can put in the account of people who are the poorest in the country. Mr Gandhi added that the think tank worked for six months, spoke to big economists and finally "(former Finance Minister) P Chidambaram gave me this number of 3.6 lakh which translates to 72 thousand rupees per year". He also promised that as soon as the Congress government is formed there would be a new planning commission, special status for the state and restoration of North East Industrial Policy. Mr Gandhi also levied strong charges against BJP president Amit Shah while claiming that BJP and RSS are attempting to divide the nation. "BJP's murder accused president Amit Shah said that he will get the Citizenship Amendment Bill passed. I am telling you that Congress will not allow this attack on the North East and won't let the Bill pass. This fight is about ideology," said the Congress president. He added, "On the one hand, BJP and RSS are trying to divide the country by spreading hatred everywhere, on the other hand, Congress is uniting the country". Setting the narrative for the upcoming Lok Sabha polls, the Congress party on Tuesday released its manifesto in which special focus has been on youth and farmer. Congress has promised the creation of jobs to filling up vacancies and providing a minimum support income of Rs 72,000 per year for the poor families.